In 1999, a seemingly unremarkable elderly woman named Melita Norwood was exposed as a major intelligence source for the KGB, having provided the Soviets with highly valuable information from her job at the British Non-Ferrous Metals Research Association for over 40 years. Twenty years on from her exposure, and nearly fifteen years after Norwood’s death at the age of 93, Hollywood has caught wind of the story and used it as inspiration for Red Joan, a movie that somehow manages to discredit Norwood even further by being a dull, dry slog of a film that nobody would find the least bit interesting. Characters are re-named for this fictionalised version of events, with Norwood being referred to here as Joan Stanley, who we see in the opening moments as an elderly woman (played by Judi Dench) be placed under arrest on suspicion of treason, and is subjected to an endless line of questioning from some extremely one-note police detectives who have permanent scowls etched across their faces like complete sociopaths. The sequences with Dench more or less serve as a thin framing device, with the majority of the action taking place when Miss Stanley is a younger woman (portrayed by Sophie Cookson) and when she is drawn into a group of Communist sympathisers whilst studying physics at Cambridge. She later goes on to assist nuclear scientist Max (Stephen Campbell Moore) who is helping develop the atomic bomb, and it is these secrets that she decides to share with the Russians which leads to her arrest in the present day (the present day here being the year 2000). The movie has picked a real-life story that not a lot of people know about with a figure that’s even more obscure, but the film does such a passionless job at making either one of those elements engaging or even cinematic that by the end, you’ll come out of it knowing even less about this person and the things she did. Red Joan treats this fascinating real-life story with a been-there-done-that-got-the-t-shirt attitude in its dramatized format, with nothing new or interesting to say about the nature of KGB espionage during the early days of the Cold War, and certainly not a single ounce of intrigue about why this woman ended up doing what she did. Her character motivations are full of holes that make her seem quicker to turn to the other side than Anakin Skywalker did in Revenge of the Sith; you never fully buy the reason why she suddenly decides to slip the secrets to the Russians, especially after several scenes of her sternly refusing the request from her on-again-off-again Russian Jew boyfriend Leo (Tom Hughes) who’s such an arrogant fop that you wonder why anyone would be attracted to this guy outside of just his good looks, yet she does it anyway for very thin reasons that are too bland and dull to fully explain. Her poor characterisation is just a minor piece of evidence that the film is just not very well-written; all of the dialogue is comprised of exposition with little to no traces of humanity, and all the characters from the lead to several of the supporting players seem to only have no more than one dimension to them at times, making them very unengaging and not in the least bit fascinating enough to watch an entire movie about. All of the KGB loyalists have only one motivation, and that’s to charm their way into this woman’s life like snakes and influence her enough to get her to share what she knows, and while it’s more than enough motivation for one character, to have at least three others be the exact same way means that it gets old fast, and not done with any kind of alteration to make it fresher than the last. Meanwhile, the scenes where the character is played by Judi Dench serve as nothing more than a complimentary framing device, with Dench picking up an easy paycheque by mostly just sitting in interrogation rooms and in the comfort of her own home while occasionally offering even more expository dialogue that we had already seen play out in the flashback segments, having dreary conversations with the police interrogators who once again have zero character to them other than to look constantly angry with this elderly woman as they talk to her, and with her adult barrister son (Ben Miles) who has his own Han Solo moment in a climactic scene that’s ridiculous as well as a rather weak attempt at family drama. There’s really not much to this film that truly stands out, other than the acting which never goes beyond being just fine, but it is made even more disappointing when you think about the much more interesting movie that could have been developed from such a mind-blowing true story. You are more than entitled to your own opinions about the real Marita Norwood and her actions throughout her life, but no matter what you think about her you can look at this film and see that it’s kind of a disservice to present a fictionalised version of her life on the big screen and have it be such an unengaging, endlessly dull attempt to appeal to a certain age demographic that most likely aren’t going to be as interested in this story as the film wants them to think. An ending title card reveals that the real Norwood was never prosecuted for her espionage, but having a film like Red Joan come along and make everything she did seem so boring and unengaging is probably the biggest punishment she could have received. 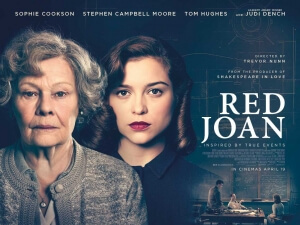 Red Joan does a poor job at making a fictionalised version of exposed KGB spy Marita Norwood’s life story seem engaging and cinematic, instead offering an endlessly dull and poorly written espionage drama that makes it all seem really boring.